1 of 1 Whisk 4 eggs, 2 tbsp half-and-half, 1/2 tsp salt and freshly cracked pepper in a bowl. In a small saute pan, heat 1 tbsp unsalted butter over medium heat. Stir in eggs and cook until just scrambled, about 1 minute. 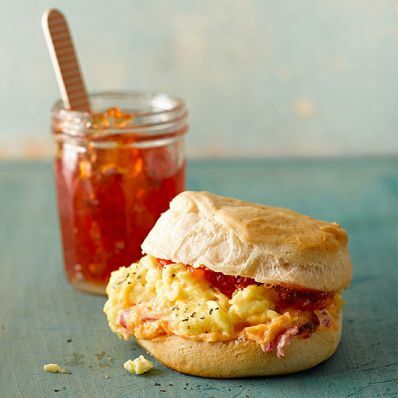 Spread 2 tbsp pimiento cheese on each of the bottom halves of 4 warm split biscuits and 1 tsp pepper jelly on the tops. Spoon eggs on bottom halves and cover with top halves.